At 4.50 p.m. on a recent Sunday, a truck carrying spares from Bangalore to Honda Motorcycles in Gurgaon stops on National Highway 7, in Attibele, on the Karnataka-Tamil Nadu border. The driver gets out and walks up to the Commercial Taxes Department checkpoint - 'checkpost', as it is commonly called in India - a printout in his hand. The official at the counter enters a number from the printout into his computer, and details of the consignment - description, quantity, value, and buyer and seller information - pop up on the screen. He waves the truck through, and it drives off. The whole procedure takes minutes. Not long ago, the truck could have been held up for hours. Under the old system, the driver had to surrender the invoice accompanying the consignment. Invoices collected by the checkpoint staff would later be cross-checked by the Commercial Taxes Department. If an unscrupulous trader could avoid surrendering the invoice, he could get away without accounting for the consignment. It was also possible for the trader to collude with the checkpoint officer and under-declare the value of the goods. 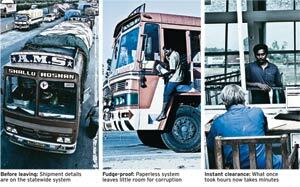 Checkpoint staff would sometimes delay a truck simply to induce the driver to cough up a bribe. Introduced in June 2010, the system, called Sugam, goes a long way in stemming corruption. Traders upload transaction details to the state's Commercial Taxes Department website (www.ctax.kar.nic.in) before moving goods - mandatory for only some items at present. This includes information about what goods are being transported, as well as their quantity, value and destination. Details about every truck entering or passing through Karnataka are accessible at all 22 static and 50 mobile checkpoints in the state. The possibility of a driver or trader striking an off-the-books deal with a checkpoint officer is thus greatly reduced. Also, since verification is now swift at checkpoints, truck drivers have little reason to pay 'speed money' to fixers who promise to expedite the process. And lastly, there is complete accountability, as the system makes it easy to identify the officer who verified a particular consignment. When the trader first uploads consignment details to the website, the system generates a number that identifies the shipment. It is this number that the truck driver presents at the checkpoint in any form, including a printout or a text message on a mobile phone. The truck is cleared quickly, unless the quantity of the goods declared differs greatly from the quantity that is being transported. It is now harder for not just checkpoint staff but also transporters to take traders for a ride. It is difficult for transporters to overcharge traders for truck rental by exaggerating waiting times at checkpoints, as waits are now short. The official at the counter at Attibele today is not regular checkpoint staff - he is Pradeep Singh Kharola, Karnataka's Commercial Taxes Commissioner, here on a visit to see how Sugam is working. The name Sugam is the acronym of 'Simple Uploading of Goods Arrivals and Movements', and applies to goods. Checkpoint staff would sometimes delay a truck simply to induce the driver to cough up a bribe. Introduced in June 2010, the system, called Sugam, goes a long way in stemming corruption. Traders upload transaction details to the state's Commercial Taxes Department website (www.ctax.kar. nic.in) before moving goods - mandatory for only some items at present. The official at the counter at Attibele today is not regular checkpoint staff - he is Pradeep Singh Kharola, Karnataka's Commercial Taxes Commissioner, here on a visit to see how Sugam is working. 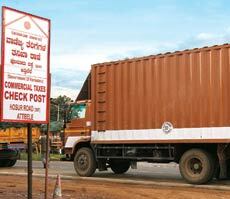 The name Sugam is the acronym of 'Simple Uploading of Goods Arrivals and Movements', and applies to goods meant to be unloaded within Karnataka. Goods that are just passing through get a transit permit called Suvega (Simply Upload about Vehicle on Entry and Go Across). Kharola's department wants to ensure it captures all transactions and plugs collection leaks for goods meant for Karnataka. For goods that are passing through, Suvega helps ensure that trucks leave the state, and do so without unloading. Tasked with mopping up Rs27,000 crore in taxes this financial year, the department launched Sugam during the last fiscal year. At present, Sugam is mandatory for commodities in which tax evasion has historically been high. These goods, which include auto parts, cement, electrical items, granite and steel, account for one-fifth of the state's tax revenue. But, Kharola says, traders find it so convenient that they use it for other goods as well. "Every day, dealers download about 70,000 Sugams, which account for 60 per cent of goods movements in Karnataka," he says. "We are seeing 25 per cent growth in tax collections this year, and some of it is definitely due to Sugam." Kharola has continued efforts launched by his predecessor, B.A. Harish Gowda, four years ago, with the help of the National Informatics Centre. Law-abiding businesses are breathing easy. "Not having to wait for hours at checkposts saves us Rs3,000 per truck per hour," says K.T. Venkatesh, Senior Assistant Manager, India Cements. His company sells around 140,000 metric tonnes of cement a month in Karnataka, and pays Rs7 crore in taxes to the state. Business houses are also relieved that transporters cannot inflate bills by citing fictitious checkpoint delays. "Earlier, even a whole day was not enough to vet papers and issue permits to trucks passing through, so drivers often stayed at checkposts overnight," says P. Gopalakrishna Bhat, Joint Commissioner in charge of checkpoints in Bangalore. Keeping paperwork manageable had meant that the department issued fewer permits, which discouraged trucks from using the state's roads. But today, Attibele alone clears 300 transit passes a day. The scene at most checkpoints across India is starkly different. At Walayar in Kerala, for example, vehicles entering from Tamil Nadu often get stuck, and end up jamming the highway. "Karnataka will soon reach a stage where it will no longer need checkposts, only mobile squads for random checks," says Kharola. Technology has replaced literally tonnes of paperwork: the amount of paper saved is estimated at one tonne per day. Karnataka's success has spurred Andhra Pradesh and Tamil Nadu to phase in Sugam-like systems. But technology alone cannot eliminate tax leaks - with these systems in place, the state still needs to police the movement of goods and ensure that traders use Sugam correctly.